March 7, 1970, was on Fred Espenak’s radar for years. “I was an amateur astronomer as a teenager, and I thought wow, it’s not that often a total eclipse crosses some part of the United States, so this may be my chance of a lifetime to see one,” the UT alumnus recalled. Fred Espenak took the solar eclipse photo featured on the new Forever stamp in Jalu, Libya, March 29, 2006. At 16, he convinced his parents to let him borrow the family car and drove 600 miles from his home in Staten Island, N.Y., to Windsor, N.C.
“When the eclipse took place, I thought I was prepared because I had read magazine articles and books about it. I had my telescope set up to take some pictures,” Espenak said. “But when that shadow of the moon hit and we were plunged into this eerie twilight, it was so phenomenal and all-encompassing that when it was over, I thought: Oh, this can’t be once-in-a-lifetime; that went way too quickly; I’ve got to see another one. Planes, trains and automobiles have taken Espenak to 27 total eclipses on seven continents. “The one in 1995 in India was unique. It was a short eclipse; it was only about 40 seconds long,” he said. Fred Espenak’s photos are featured on the U.S. Postal Service’s stamp to commemorate the Aug. 21 total solar eclipse. 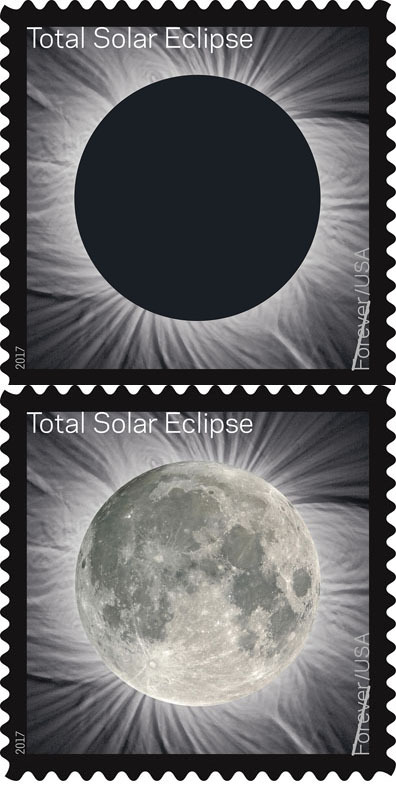 It is the first U.S. stamp that uses thermochromic ink; with the touch of a finger, the image changes from the total solar eclipse to the full moon. 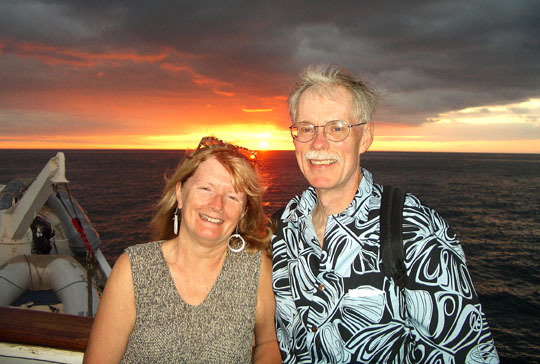 Together, the retired astrophysicist from NASA’s Goddard Space Flight Center and the retired chemistry teacher operate the Bifrost Astronomical Observatory in Portal, Ariz., and continue their quest to experience total eclipses. Next up: The Great American Total Eclipse Monday, Aug. 21. The sensational sky show that stars the moon passing between the sun and Earth will be visible in the contiguous United States for the first time since 1979 — weather permitting. “The track of the moon’s shadow will cut diagonally across the nation from Oregon to South Carolina through 14 states. Inside the 70-mile-wide path of totality, the moon will completely cover the sun as the landscape is plunged into an unsettling twilight, and the sun’s glorious corona is revealed for more than two minutes,” Espenak explained. He may be in Casper, Wyo., to watch the awe-inspiring event. “There’s a big astronomy conference there called AstroCon 2017, and they invited me to speak four years ago. I think that’s the longest lead time I’ve had for a speaking invitation,” Espenak said. “Casper is right in the eclipse path. No passing fancy, but a passing obsession with astronomical objects led to Espenak’s nickname: Mr. Eclipse. 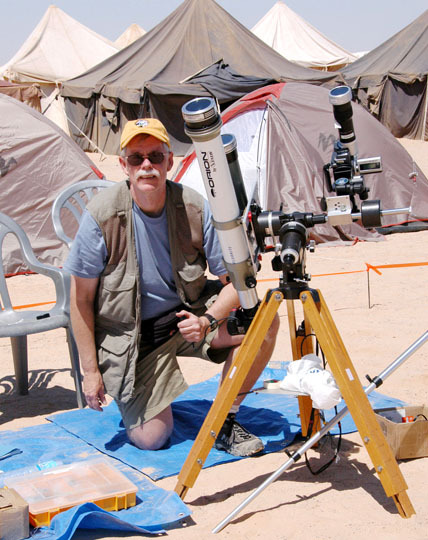 Fred Espenak operates the Bifrost Astronomical Observatory in Portal, Ariz.
That memorable moniker and his international reputation as an eclipse expert helped land an ultra-cool gig with the U.S. Postal Service. While working on two books, “Eclipse Bulletin: Total Solar Eclipse 2017” and “Road Atlas for the Total Solar Eclipse 2017,” his phone rang. Millions have seen his work; Espenak’s photos have been published in National Geographic, Nature and Newsweek. Check out mreclipse.com. “It turned out the U.S. Postal Service decided to use two of my images for this new stamp with thermochromic ink. Other countries have used this technology, but it’s the first time in the United States. When you rub the stamp, a second image appears from the warmth of your finger. You’ll see the total eclipse of the sun and, with the touch of your finger, you’ll see the full moon,” he said. To commemorate the Aug. 21 event, the Total Eclipse of the Sun Forever stamp will be released Tuesday, June 20, during a ceremony at the University of Wyoming in Laramie. Espenak and his wife will be there. Meanwhile, he is giving talks around the country to preview the celestial spectacle. Espenak will return to his alma mater to speak Thursday, June 15, at 6:30 p.m. in Memorial Field House Room 2100. 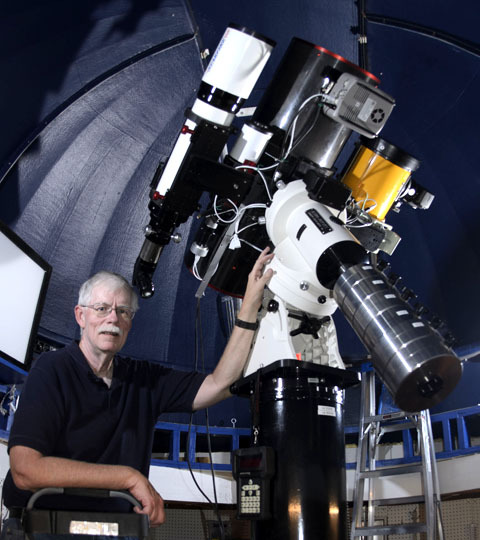 During the free, public talk funded by the Helen Luedtke Brooks Endowed Professorship in Astronomy, the 1976 UT graduate who received a master of science degree in physics will discuss eclipses and share his eyewitness accounts around the globe through video and photos. And he’ll offer two words of advice: road trip. “I’m going to show people what they can expect to see in Toledo and how to watch it using safe eye protection, but I’m also going to encourage people to start making plans for a car trip to the eclipse path of totality because that’s where you have to be to see the total phase of the eclipse, and it’s worth the drive. “It’s something you remember your entire life because it’s so unusual from anything you’ve seen before,” Espenak said. “The bright sun is completely gone in the sky, and you see this very strange-looking black disc, which is the unilluminated side of the moon, and it’s surrounded by this gossamer, feathery halo that’s the sun’s corona, which is two million degrees. It’s the only time you can see something that’s two million degrees with the naked eye. It’s such a stunning, overwhelming experience: The temperature drops probably 10 degrees as you go into totality, so you feel a chill in the air; animals react strangely; birds quiet down as if they’re going to roost at night. This entry was posted on Tuesday, June 13th, 2017 at 3:45 am and is filed under Alumni, Events, Natural Sciences and Mathematics, News, UToday .